"Soon I will pay a visit to Paris where I’ll have an opportunity to officially set cooperation and consider concrete steps for its implementation," he said, adding his government is willing to cooperate but won’t take the lead from outsiders. The Prime Minister emphasized that the austerity measures carried out under the loan agreements with the ‘troika’ of European Commission, European Central Bank and International Monetary Fund, were aimed at eliminating the crisis in Greece, but "only further deepened it,” undermining the prospects for the country’s economic growth. Tsipras said "the new government is committed to implement the reforms really needed by Greece and that its previous government did not dare to carry out," adding that his government can make such a transformation as it has no links with the past and no commitments to the oligarchy. "First of all, it’s tax reform, the suppression of tax evasion, assignment of tax levies. Besides being an act of social justice, it is an act of political solidarity with the European taxpayers who paid for the policy of intertwined interests of the oligarchy and the state of Greece," he said. Angel Gurria, the OECD Secretary-General, said the organization would help Greece achieve its reform goals. "The crisis produced low growth, produced high unemployment and ... Greece has suffered this very directly," he said at a news conference with Tsipras. "It produced growing inequalities and it produced a very serious erosion of trust." The Greek economy has gone through a major downturn since the country’s previous government imposed austerity measures in exchange for an international bailout. As a result, Greece faced a debt of €317 billion, more than 50 percent youth unemployment, and 20 percent of the population living below the poverty line. Stocks were muted on Wednesday with the Athens index bouncing back over 3 percent ahead of an emergency meeting of eurozone finance ministers which will discuss the terms of Greece's international financial aid. The country is appealing for easier bailout conditions but doesn’t plan to ask for an extension of the current agreement that expires in late February. Instead, the government is expected to propose a bridge loan to cover its funding needs until September and offer new economic reforms to replace some of the previous government’s austerity measures. Greece’s €317 billion debt has been a major stumbling block in the EU, with creditors such as Germany starting to question the country’s membership of the union. The Greek government said it will seek assistance elsewhere if EU countries don’t agree on an alternative deal. 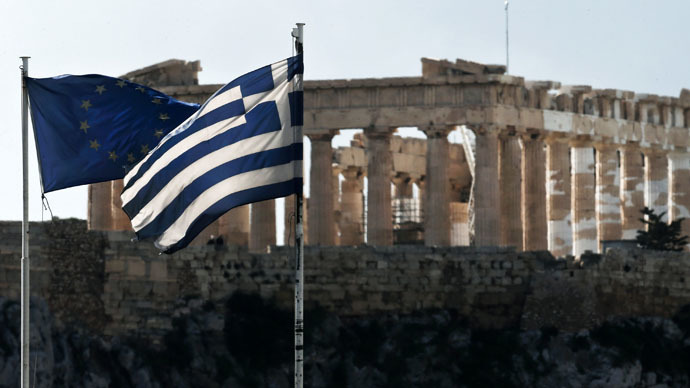 Russia has already considered providing financial assistance to Greece should it be asked. So far there haven’t been any talks with Russia or any other potential creditors such as China.